The controversial Upper Paunglaung dam was built to supply electricity to the country’s newly built capital Naypyidaw. Opposition and complaints from villagers and civil society groups marked the construction and inauguration of the dam, because the consequences for local ethnic groups have been severe [1,2]. Concrete plans for the hydropower project were first discussed in 2002, based on a field study carried out by the Ministry of Electric Power and Japan’s Kansai Electric Power. A few years later, in 2005, Swiss Colenco Power Engineering Ltd. elaborated a feasibility study for the government . 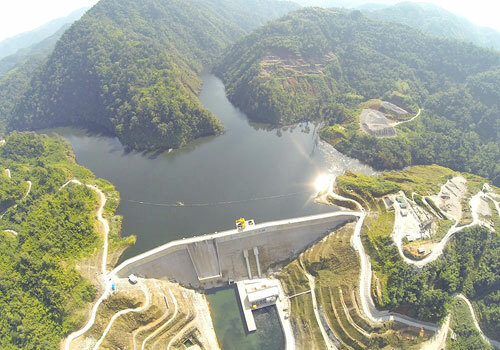 The Memorandum of Understanding (MoU) to implement the dam was signed on September 1, 2005, between the Hydroelectric Power Department of the Ministry of Electric Power (MOEP) and China’s Yunnan Machinery and Export Co. Ltd (YMEC) . 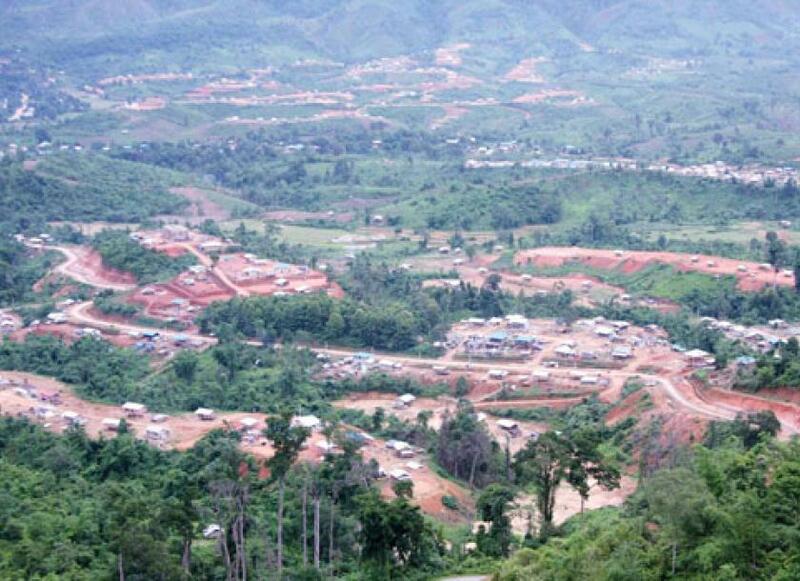 The construction work started in 2006 [2,4] and was accompanied by an increase of Burmese army troops to secure the area formerly controlled by the Kayan New Land Party (KNLP) . A test run of the spillway was conducted in 2008 . The project was finalized in 2013  and connected to the national grid in late 2015 . The reservoir drowned an area of about 6,100 ha of forest land and cultivated rice fields , as well as religious temples and sacred graveyards of the villages that were flooded . Deforestation, habitat loss and changes in the unique river ecosystem are some of the strong environmental impacts the dam has caused . The social impacts were devastating. A report from the civil society group Kayan Women’s Union informed about grave abuses, such as forced labour and displacement. 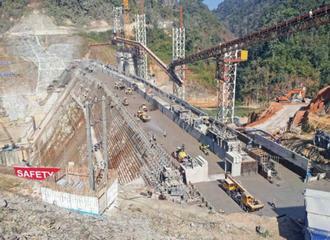 Increase in militarization and rising tensions with local groups accompanied the dam development [for details, see 1]. A report from Physicians for Human Rights (PHR), Land in Our Hands, and Kayan New Generation Youth documented that more than 8,000 people were relocated at the cost of human rights violations, forced displacement and livelihood loss . The Myanmar Times stated that more than 10,000 people from 23 villages were evicted since April 2013 to make place for the large dam [3,4,5]. Among the affected groups were ethnic Kayan Lahta, Shan, Burman, and Pa-O . Most were moved to a relocation site near the Lein Li bridge, close to the middle of the reservoir . Residents were not well informed about the displacement process [1,2]. They first learned about the project when officials came to place markers in their village to assess the water line for the reservoir, some villagers said . Many residents only realized that they would be displaced once construction work had started . While the government assisted the relocation through the provision of new housing infrastructure and farmland, villagers and civil society groups were deeply concerned about related livelihood losses, provoked by the drowning of traditionally used farming, fishing and forest areas [1,2,3]. The relocation sites were hilly and lacked enough fertile plain to offer sufficient land to everybody . Compensation procedures were reported as irregular, corrupt and not transparent [2,3, see also DBV news video link, below]. In several cases, the payments were insufficient to cover the costs imposed by the relocation on the villagers [2,3]. There was a lack of drinking water supply [2,4] and the loss of land – the most important livelihood resource – caused a lack of food supply, severe livelihood problems and increases in poverty. The PHR study described furthermore the emergence of social problems, such as depression, increasing alcoholism and child abuse . Given the severe situation, several people attempted suicide by drinking pesticide. As of October 2015, six were hospitalized and four died [2,6]. Mobilizations against the project arose although they were partly suppressed by the government. Complaint letters sent by community leaders did not receive responses. Some community organizers were reported to be arrested and beaten for a traffic violation – apparently as an act of retaliation . Key informants shared later that many refused to voice complaints out of fear of reprisals . Despite the difficult situation, activists organized to share their concerns. 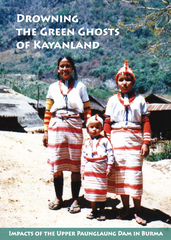 In 2008 The Kayan Women’s Union published the report “Drowning of the Green Ghosts of Kayanland” that described the livelihood impacts and the abuses by caused by the army . In November 2013, some residents travelled to Yangon to explain their concerns in a press conference . The civil society organizations Land in Our Hands, Kayan New Generation Youth and Physicians for Human Rights (PHR) published a study in October 2015 on the livelihood and health impacts of the dam development to address the severe issues that were imposed upon local populations [see 2 for the full report]. Several other groups such as the Salween Watch Coalition , or Burma Rivers Network  critically reported about the project. Some officials acknowledged the difficulties the dam project faced. In an interview, a deputy director from the MOEP told the Myanmar Times, “It was the most complicated hydropower project that we have ever built, both technically and socially” . However, despite of the severe social impacts documented by civil society groups, officials deemed the project a success, and called for the opening of more power stations to meet the country’s growing electricity demand . Civil society groups, in turn, strongly oppose any further dam development in Myanmar and call for a countrywide halt of large dams. 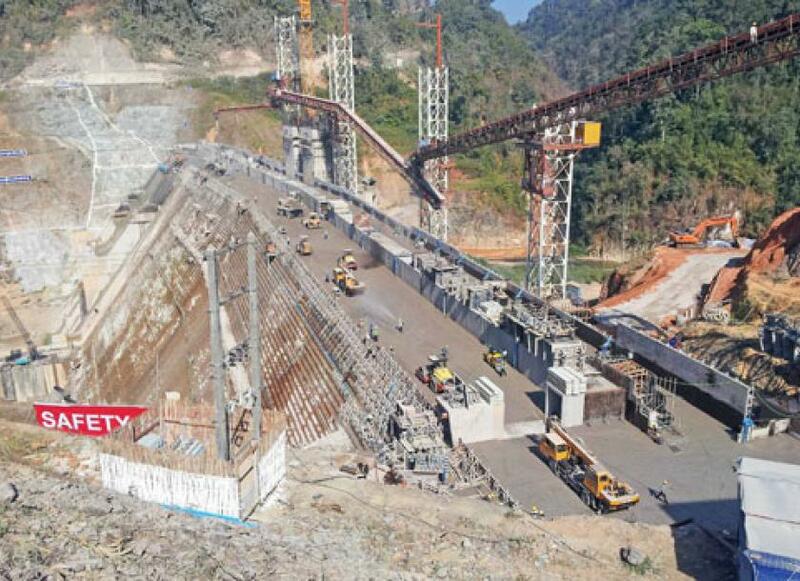 Project Details The Upper Paunglaung hydropower dam is located about 42km from Pyinmana town, half way between the capital Naypyidaw and the town Loikaw [2,3]. The dam has a capacity of 140 MW, comprised of two turbines. The concrete dam is 1,690 foot (515m) wide and 322 foot (98m) high [1,3]. Project cost was reported at 31 billion Kyat (USD 24,000,000) . According to the report by PHR, the dam was financed and built by Chinese, Swiss and British firms. The Ministry of Electric Power (MOEP) was the project lead. China’s Yunnan Machinery Equipment Import & Export Company and AF Group of Sweden (through Colenco Switzerland) were among the consortium members for the construction of the dam [1,8,10]. Burma Rivers Network mentions the involvement of the Export-Import Bank of China (China Exim Bank) . Also, UK-based engineering firm Malcolm Dunstan and Associates and the German company FOSCE Consulting Engineers were named to be involved [1,6,9]. The Ministry of Agriculture and Irrigation, and the Ministry of Forestry managed the relocation of residents to make way for the reservoir . The Ministry of Home Affairs was responsible for issues appearing in the relocation site . Why? Explain briefly. The project started operations despite its devastating impacts. There were no signs of adequate redress of the impacts caused by the dam. Compensation procedures were reported to be insufficient, not transparent and irregular. Kayan Women's Union, 2008 "Drowning the Green Ghosts of Kayanland: impacts of the Upper Paunglaung dam in Burma". (accessed online 17.09.2018). Physicians for Human Rights (PHR), October, 2015. "Forced Displacements and Destroyed Lives around Upper Paunglaung Dam in Shan State, Myanmar". (accessed online 17.09.2018). The Myanmar Times, 07 October 2015. "Relocated villages face water shortages". (accessed online 17.09.2018). The Myanmar Times, 11 December 2015. "Controversial Upper Paunglaung dam joins national grid". (accessed online 17.09.2018). The Myanmar Times, 08 September 2014. "In mountains near Nay Pyi Taw, a test case for hydropower sector". (accessed online 17.09.2018). Al Jazeera, 30 June 2016 "Myanmar: Hydropower and the cost of life - Suicide rates and poverty are on the rise among rice farmers displaced by Myanmar's Paunglaung Dam". (accessed online 17.09.2018). The Myanmar Times, 07 November 2013. "Complaints emerge over Paunglaung Dam compensation". (accessed online 17.09.2018). Salween Watch Coalition, June 18, 2008. "New Hydropower Dam for Burma’s Military Capital to Displace Thousands". (accessed online 17.09.2018). Burma Rivers Network on the Upper and Lower Paunglaung Dams. (accessed online 17.09.2018). The Financial Times, March 21, 2014 "Villagers count cost of Myanmar dam project". (accessed online 17.09.2018). DBVTV News video "Shan dam causing waves"